Life and business just don’t work that way and my guests on my “All the One Things” Panel, Steve Cunningham and Joe Girard confirm this concept in a big way. I don’t think I could have hand-picked a better ONE Thing expert panel than we put together for you in this episode. These guys are two of the most enthusiastic ONE Thing enthusiasts I’ve ever met. Steve is the founder of ReadItFor.Me , an amazing service that takes best-selling business and personal development books, summarizes key points and delivers them to you using engaging videos, workbooks and other tools and the videos in a really cool, fun way. I visited ReadItFor.Me and guess which book I found on the home page? So if you have not yet taken the time to read Keller and Papasan’s book, go to ReadItFor.Me and watch the 10 minute summary, it’s brilliant! Steve’s also a keynote speaker and wealth of knowledge and I’m feeling blessed to have him on the show. Check out the links below or click here for special lifetime membership for over 80% off, just for being a listener of The Make it Snappy Productivity Show. We’ve also brought on Sales Hero and mentor, Joe Girard. Joe’s an authority on empowering people to sell more and have fun without being weird…pretty important when it comes to sales. He has an electric personality - you can really feel the passion in his voice and Joe’s nuts about the ONE Thing…and I can testify on his behalf…I didn’t feel weird at all, not in the least bit and I don’t think Steve did either so Joe knows his stuff man! Two amazing deals from two incredible guys, so definitely take advantage of both deals. Get high level sales training that normally costs thousands of dollars per month! 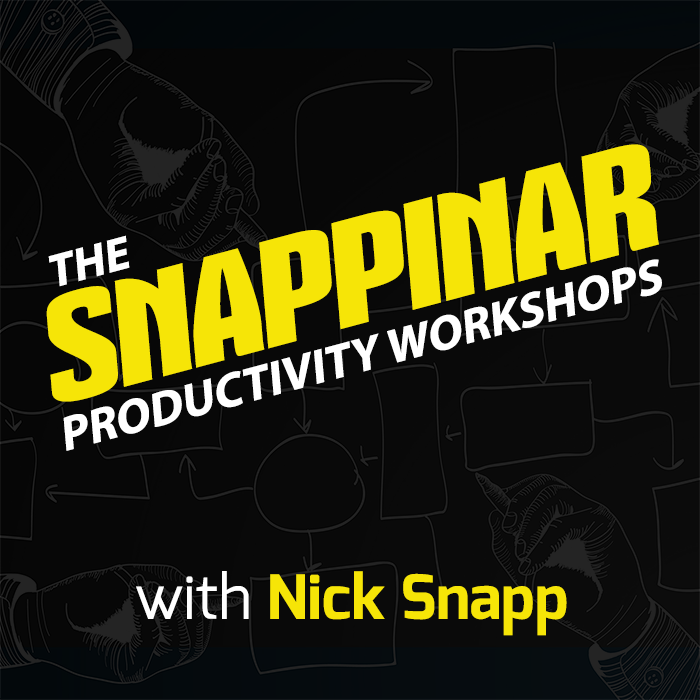 The Snappinars Productivity Workshops will show you how to stop wasting time and energy and start getting so hyper-productive you could take a day off each week. Simple and effective. Click here for your free two-week trial. Special Pre-Sale Offer Before Christmas! Real Accountable (RA) is Nick's call-you-out, hit-you-between-the-eyes, not gonna put up with your lame excuses, accountability for entrepreneurs. My BETA test group is going on right now and it's been such a massive success that we're planning to grow this program to 200 hard-hitting entrepreneurs in 2017. From now until Christmas, lock your seat at 23% off the normal price, which comes out to about $75/month. So if you want in, text SNAPPY to 44222 or email me: nick@makeitsnappyshow.com with "Real Accountable" in the subject line.